Mirror, mirror on the wall, Who’s the ugghliest of them all? Pakistan has suffered such an amazing array of villainous leaders for its short history, found otherwise only in Bollywood action-thrillers, that it becomes difficult to identify the lead-villain and to answer the million dollar question of who gets the million lashes award for costing the most millions to Pakistan.I muse about this issue frequently and deeply. Unable to figure out for myself, in frustration, during along sojourn in the quiet room, I turned to the mirror on the wall for the answer. In Pakistan today, very few can genuinely challenge the hateful sermons of self-righteous Mullahs. Voices that call for reason, moderation and universal human fraternity appear weak when confronted with the fire-breathing preaching of these religious parties. The state apparatus seems vulnerable and cautious whenever challenged by any party that uses a religious excuse for street violence or a puritanical argument for a perverted purpose. So sentimental are our sensibilities to religious affiliations and ‘ghairat’ that anyone that calls for a rational discourse can be labeled a traitor or blasphemer. There is no priesthood in Islam yet our masses remain pitifully attached to religious scholars who act as if they have been commissioned by God. 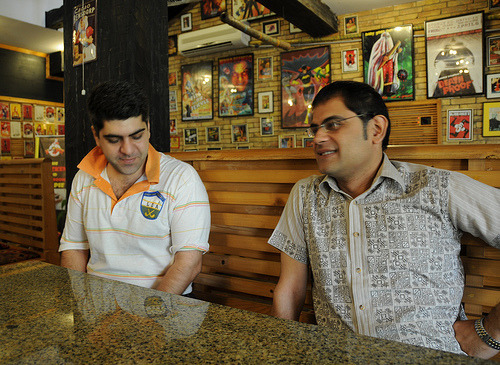 Rafay Alam (left, with popped collar) and Raza Rumi (right, in block print) hang out in a Muslim burger and ice cream joint with their Muslim shirts. In the background: very Muslim gory pop art on the walls. Yasser Latif Hamdani sports a serious expression, in the middle of July. We are a strange people. We love to spit on the people who help us. I am not talking about countries, because they help us according to the dictates of international politics, but individuals like Angelina Jolie, who opened up her heart and her purse for this country in a time of need.